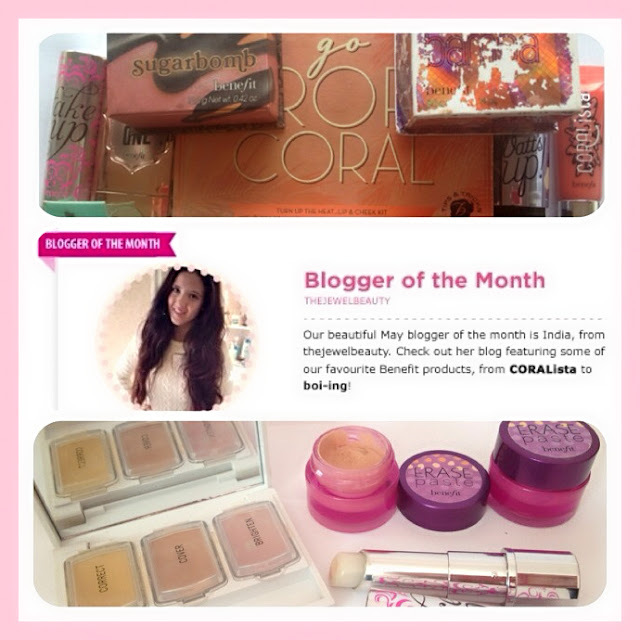 So, I have some super exciting news for you all as I have been selected as Benefit's Blogger Of The Month!!! - OMG I was so excited, that I had actually been noticed by one of my favourite beauty brands. I have been using Benefit products for such a long time now and have around 20 products from them ( a bit obsessed maybe?!) haha. Benefit are such a fun brand and definitely inject some serious life into my make-up collection. Once I get my huge uni final out of the way I'm thinking about doing a post on my Benefit Makeup Collection, as I think it would be a really fun post and a good way to share with you all the products that I love from Benefit. I just wanted to make this post to thank-you all for sticking by me and my blog, because these kind of achievements wouldn't be possible without my loyal readers and I really do appreciate it. Hope you are all doing well my lovelies! I really enjoy reading your pretty blog, best of luck with the COSMO awards. congratulations India! that's absolutely amazing, how exciting to be noticed by a favourite brand! wow! so happy for you! I have a new blog and would love some followers to help me out!! Yay! Congrats India! :) Would LOVE to know how you made your beautiful banner? So glad I have found your blog! Congrats on the award, its no surprise as you obviously work so hard and your blog is an inspiration to a new blogger like myself! I love Benefit products, they are without a doubt my favourite make-up brand and I also have way too many products!